Frankly I consider that the above statement could not be more accurate. Who really expected Cameron to take action against world hunger? Do you really believe he and the other G 8 members will actually crack down on tax dodging. I also have to question that even if this did happen would the money that governments receive from corporate tax dodgers actually go towards alleviating hunger and poverty here or aboard? The scale of hunger is truly shocking. Yet there is enough food in the world for everyone, nonetheless 1 billion people continue to go hungry. Consider the following shocking facts. Over two million children every year die from malnutrition; about 16,000 children every day or one child every five seconds. One in eight people around the world go to bed hungry. One in four children are stunted through chronic malnutrition – 165 million children are so malnourished by the age of two that their brains and bodies will never fully develop. About £6.17bn a year would be needed to save the lives of a million children under five who die of malnutrition annually. This money is available now! Food to feed everyone who needs it is available now! We need immediate and radical change if we are going to stop this serious injustice and consign hunger and poverty to history were they belong. What is Enough Food For Every One If Campaign all about? “We want our leaders to act on the four big issues that mean so many people do not get enough food. The burning question is will these measures – most of which are inadequate to address the problem of world hunger – be carried out? “Today (18th June) the G8 countries signed a declaration which made promises to tackle tax avoidance and tax havens. Yes I supported the campaign as any positive action is always worth taking even though you know that nothing much will come of it – at least not the result we would like. Nonetheless such campaigns promote the scandal of world hunger and poverty so they are always worth supporting. However after the event we have to ask: what did we really expect to happen? What did we expect Cameron to do for people in Africa and other developing nations when he himself and his government have waged war on poor people in the UK. When the unelected coalition government have reduced the living stands and the quality of life for the most vulnerable in our country by viscous welfare cuts to sick and disabled people including children and those who are by no fault of their own unfortunate to be unemployed or on a low wage. The sad reality of the situation is that as long as right wing political agendas go unchallenged and the capitalist system continues millions of people will die from want of food in a world of plenty. While the capitalist system runs roughshod over the entire planet millions will continue to go hungry and malnourished and will lead impoverished lives. Under the capitalist profit driven system, almost half of the world’s population struggles to live on less than $2.5 a day while a tiny minority of billionaires and millionaires continue to reap massive profits and live lavish lifestyles. While eight over privileged people with more money than they need discussed world issues concerning hunger in the comfort of the luxurious venue of Lough Erne Resort in Northern Ireland, an extravagant 5 star hotel, eating expensive meals, and no doubt sipping expensive champagne, 25,000 people died of hunger over each of the two days of the summit as they do each and every day. Sadly they will continue to die until we rid the world of the economy of greed, the capitalist system that destroys the lives of millions, exploits the earth and drives to extinction countless species with whom we share this planet. The cost of this decadent and pointless charade was around £50 million. I wonder how many starving people this would have fed. When are we going to say enough is enough and demand the fair and responsible distribution of the world resources? When are we ever going to question the right of the few to own and control the world’s wealth, its resources and our lives. Yes by all means make the greedy robbing capitalists pay their taxes but question the right of these parasites, the one percent to control so much of the world’s wealth to line their own packets while others go hungry. How many really question the right for an individual to have millions even billions in the bank. How can we rely on the G8 to end world poverty when it is they who have plunged more people into poverty as they make the poor pay for the crisis of the capitalist system? Yes indeed it would go a long way to address world hunger but again I have to ask how can we be sure that government’s will spend taxes to help alleviate world hunger. 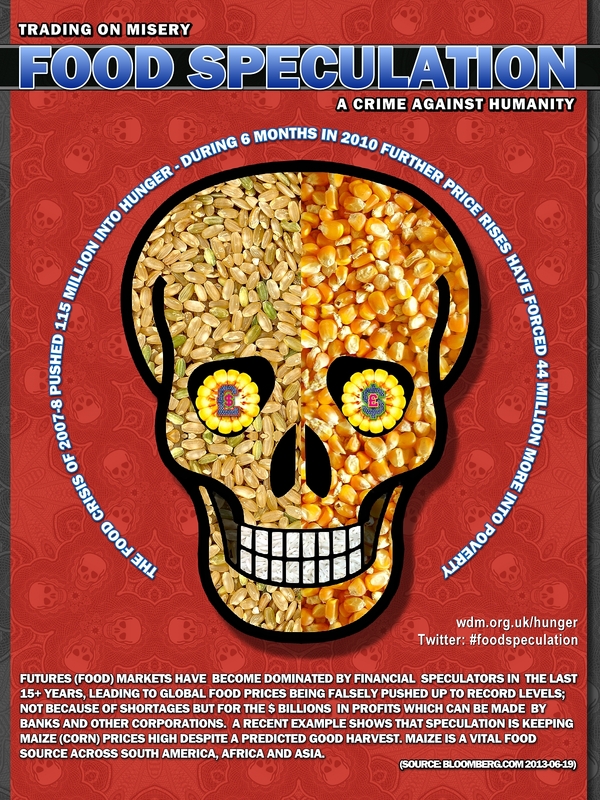 Indeed It is a scandal, a grave social injustice that while there is enough food for everyone millions die of hunger. It is time is it not to rethink our whole economic structure, yet comparatively few people do and readily accept the right-wing politics of greed and inequality along with the capitalist system that is responsible for hunger and poverty. Allowing corporations to dodge taxes is shocking in the extreme and is frankly a crime against humanity when it comes at the expense of other people who go without food as a consequence, as is food speculation, another grave social injustice that has resulted in the rise of food prices thereby worsening an already bad situation. While corporations are allowed to use and exploit other people and the very earth itself nothing much will ever change. It is time for a more fair distribution of the world’s wealth. While millionaires and billionaires live a decadent lifestyle, born of exploitation and insatiable and unbridled greed millions die ,it has to stop now and forever. By all means continue to support campaigns such as Enough Food for Everyone If as it and other similar campaigns highlight the plight of millions of people who go hungry, the approximately one billion people do not have enough food, a staggering number impossible to imagine. But question the entire economic structure of greed and inequality. It has to change. The next 48 hours are crucial to making sure world leaders don’t leave developing countries out in the cold when they meet for the G8 summit on Monday. In the next few days they could make big decisions to crack down on tax havens that are draining poor countries of billions, and stop land grabs that are driving hunger for millions of people. But if we don’t keep the pressure on, our demands could fall short. Please call David Cameron’s office on 020 7219 4272 to demand that he makes sure developing countries aren’t left out of the G8 tax deal. Click here for some suggestions on what to say. Or post your message straight to his facebook page. David Cameron knows the heat is on him – last week he saw 45,000 of us rally together in Hyde Park, calling on him to make 2013 the beginning of the end of hunger. Please take as much action as you can. In a world of plenty no one should go hungry, it is a crime that they do. There is enough food for everyone. World leaders need to take urgent action and we need to pressure them into doing so. Apologies for the rather messed up formating. As this is an urgent action I do not have time to sort it all out.